I have a problem with debt. It is a poison that flows though our society, but we have become so accustomed to it that we have become increasingly numb to the pain that it causes. Debt has immense power over us and through its proliferation we have become its slaves. Levels of personal debt have risen steadily for years and now too many of us are deeply wrapped up in this debt through mortgages, credit cards, loans and overdrafts. While the sun is shining the majority of us manage our repayments well enough, but it only takes a sharp unexpected shock to threaten that stability and plunge us into a nightmare of unaffordable repayments. For those of us on low incomes the cost of everyday living alone can be enough to push us over the edge. This is the case both at an individual level and at a national level too. 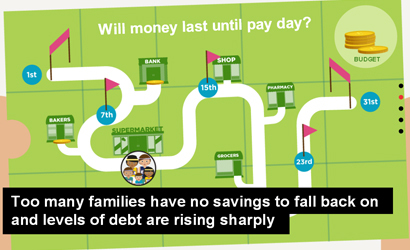 Last year the UK’s debts stood at over £1 trillion – that’s £18,600 for every adult and child. We were happily carrying this huge and increasing debt until the crash of 2008 and since then we’ve been paying a heavy price for this burden hanging over us. Just imagine for a moment how different life would currently be if we had been a lot more prudent over the last couple of decades and kept our spending rather more under control. Would foodbanks be making the headlines in quite the same way if that had been the case? The recent DEFRA report on food aid along with the most recent Trussell Trust statistics put personal debt as one of the main causes for foodbank use. Sometimes excessive personal debt is a result of poor money management and financial decisions. Sometimes it can be due to no fault of our own. But when it begins to get out of control, those who pay the heaviest price are not adults, but children. The vast majority of parents try to build normal lives for their children, but too often this type of debt can wreck their efforts. For some families – particularly those on low incomes who on average face higher interest charges – debt repayments and creditor demands can spiral into unmanageable situations that can devastate lives. Repayments have forced nine out of ten parents in problem debt to cut back on essential items for their children within the last year. Debt can damage a child’s mental and physical health. It can undermine relationships with peers and their school experiences, and cause long-term harm to a child’s life leaving them sad, confused and scared. national and local). However, this is only part of the problem; an additional 2.9m households with dependant children have struggled to pay their bills and credit commitments over the previous 12 months, putting them on the edge of falling into problem debt. The Children’s Society launched The Debt Trap campaign last week to raise awareness of debt’s devastating and under-reported impact on children’s lives. The accompanying report, The Debt Trap: Exposing the impact of problem debt on children, examines the issue in more detail and sets out a series of recommendations to address many of the problems. The main focus is directed towards the need for affordable credit and tackling the exploitative practices carried out by payday loans companies. It is a good and important campaign that deserves widespread support. As an openly Christian organisation (the full legal title is still The Church of England Children’s Society), their work representing the most vulnerable children is underpinned by Christian values and Biblical theology. For The Debt Trap, this has been borne out in the form of an additional report released to go alongside the campaign’s main one entitled: Who Bears the Burden? Christian theology and the impact of debt on children. This poses an interesting question. What is a Christian theology of debt? Theology is never ‘merely academic’ in the common sense that implies it has no practical application. On the contrary, theology – that is, thinking about God, the world and ourselves – compels a response in action and decision-making. Sometimes the cost of such a response can be both high and demanding. The report includes an excellent short paper on the Biblical understanding of debt by Luke Bretherton, the Associate Professor of Theological Ethics at Duke University in the USA. It is well worth reading in its entirety. He argues that the issues of debt and liberation from debt slavery are at the very heart of the Bible. Far from being peripheral texts that we can ignore in today’s, very different, society, the Bible’s teaching on lending and on usury (the lending of money at exorbitant interest rates) is key to understanding what Christianity means by ‘redemption’. So at the heart of the story of salvation we find the power of money and liberation from debt. The admonition that we cannot serve both God and Mammon (Matthew 6.19-24) is not a trivial matter; the central drama of salvation history is an act of liberation from debt slavery. To put the pursuit of money before the welfare of people, and use money to re-enslave and exploit people, especially the poor and vulnerable, is to turn your back on God’s salvation and deny in practice the revelation given in Scripture of who God is. Whereas to use money to serve the common good, and in particular to relieve the poor, is a mark of salvation. Bretherton moves on to argue that the Bible makes a distinct difference between taking advantage of those in need by lending to them at exorbitant rates of interest and lending where both parties choose to enter into an agreement. Biblical legislation concerning the lending of money frames it as a good thing to do as a response to seeing someone in need, in particular when no interest is charged. On no account should another’s misfortune be turned into an opportunity for personal gain, exploitation, oppression or abuse. The effect of responsible lending is to draw people into relationship with each other who ordinarily might have nothing in common or who may be deeply suspicious of each other and have no shared life. Credit though also gives enormous power to the creditor. In some cases, it can be a power to rival that of an emperor, and its effects can be hugely destructive on social and political relations. This is why the provision of credit must be tightly regulated if it is to remain just and fair. Interdependence and mutual responsibility are inherent in the action of borrowing and lending. If one part of the body suffers, or if only the interests of the few are attended to, eventually all suffer as the system collapses, as we saw during the crash of 2008. The question confronting the church, past and present, is how to prevent unjust and extortionate interest rates, encourage responsible lending, and as Christians, point to a deeper reality and truer foundation for human life, one based on loving kindness and generosity, not maximisation of profit and the private pursuit of selfish interests. This is an enormous challenge, but one that the Church cannot ignore. Justin Welby’s threat to compete Wonga out of existence through the expansion of credit unions is a direct and assertive response to the payday loan sector which is becoming increasingly aggressive in its pursuit of the poor and vulnerable. Churches around the country are running money courses and debt advice and management centres. They are working with existing organisations, charities and credit unions as well as campaigning locally against exploitative lending to address the needs they see in their communities. This is all theology in action, turning belief into life changing work. It is where the Christian faith gets dirty and gets real. There are other big issues around how much income we each need in order to live, but the thing is unless we start to change our attitudes to debt and get to grips with this epidemic, then very little is going to get better for these 2.4 million children. It’s radical stuff that fundamentally questions the way our society functions, but it is in the very nature of Christianity to do so. Debt is not in itself evil. We need banks, mortgages and loans to allow our society to work effectively, but when the result is widespread misery, then something is clearly wrong and to leave this to fester is far from acceptable. As is so often the case the Bible gives us a template and vision for a better way of life. The Church has the job of doing what it can to model it and fight for those who need God’s grace the most. The new Education Secretary, Nicky Morgan is a Christian – so what? The pay day loan companies are a blight but they only exist because government is to weak to stand up to them. All three major parties have had an opportunity to do something about the problem over the last ten years and non does. The god of the market place must be given free rein to enslave the poorest and most vulnerable in our society. No – if they didn’t exist, the poor would end up going to the unregulated loan sharks. The worst the pay day loan companies can do is drag you into court; kneecapping and broken bones is surely a worse fate. Yes you are right – there is a need for short term loan provision. Loan sharks are far more evil than any payday lender. Justin Welby wasn’t talking about competing Wonga out of existence and leaving a void, rather providing something much better and fairer. The problem with much of the payday lenders’ advertising for example is that it makes loans sound lovely and easy, masking the reality of the costs, especially if they are not paid off quickly. Just as with foodbanks the problem is not their existence but the numbers of people who feel they have to use them just to get by. Thank you for this post, it is both challenging and inspiring. I do wonder what would happen if more of us made it a way of life to ‘put our money where our mouth is’ in our lives and communities. It strikes me that one major barrier to this is trust- do we really trust God to provide for our needs, and are we prepared to trust each other with our finances, whether that means being accountable to each other, or entering into responsible and empowering creditor/debtor relationships? Excellent article, Gillan. Very many thanks indeed.This guy Bretherton clearly knows his stuff, I think. Also related is the Church of Scotland’s version of the Lord’s Prayer – ‘forgive us our debts as we forgive our debtors’.